I guess there's going to be a bit of an XMas break for the next few weeks.... our next normal Pub Scrawl would be on the 24th, so that's a no deal. Look for us to be back live on the 7th of January, 2013! 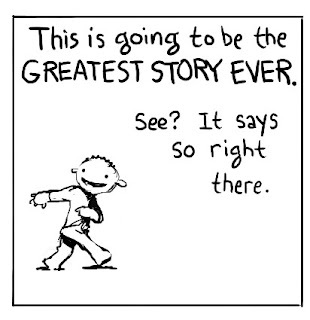 There may even be a new event for a New Year. We'll keep the chatter minimal for the next few weeks to let everyone relax for their Christmas break, but there will still be a small update on the 31st. Keep an eye peeled. While we're waiting for the New Year and the next Pub Scrawl, we can make some art for our friends over at The Gazebo! Their theme for their next free RPG Magazine is "virtual gaming". Send them something now! Helen Gomez is publishing a list (the? 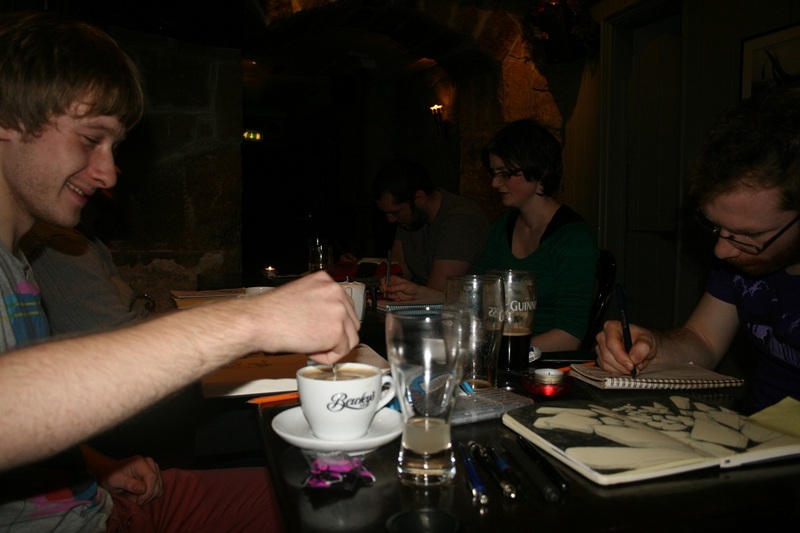 list) of Art Workers in Galway so let her know if you want to be included. Kevin Gough (honorary Pub Scrawler, but more usually a Cork Drink & Draw'er) had some his art selected for an exhibition in the Glucksman Gallery in Cork. This exhibition is moving around the country so keep an eye out for it! Congratulations Kevin! I've been updating my blog more recently in the last while. I would appreciate any views, comments and feedback! Don't forget to check out everyone's blogs, DeviantArts etc - mostly listed under "Our Lovely Members" over on the right hand side. Also, keep an eye out for a new tab up top with everyone's websites and details. We have one of these new Google+ Community pages for you to come join. Dan Dos Santos posted a how-to about how to photograph your paintings. Stephanie pointed us toward the Sketchbook Project, a travelling library of Sketchbooks. 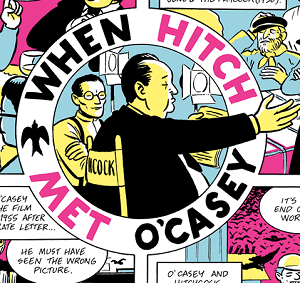 Declan linked to OFF LIFE - an online version of the UK Indie Comics Magazine. The Audio Stream for "The Perfect Bait" by Bobby Chiu is free until the 10th of January. Go listen! 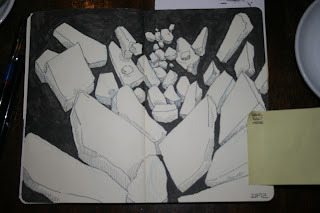 I LOVE the idea behind The Sketchbook Project II. I want to do something similar someday with Pub Scrawl. 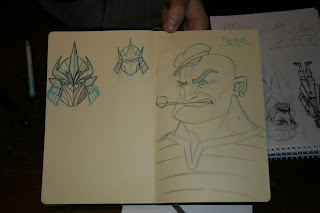 I also LOVE collaborative Sketch Blogs. Joy Teeth is back active on Tumblr. Check them out. You'll find very little as charming as the Greatest Story Ever Told. And everyone should check out these Anamorphic Illusions! Phil Barrett over at Blackshapes made this cool promo image for the "Culture File" podcast. 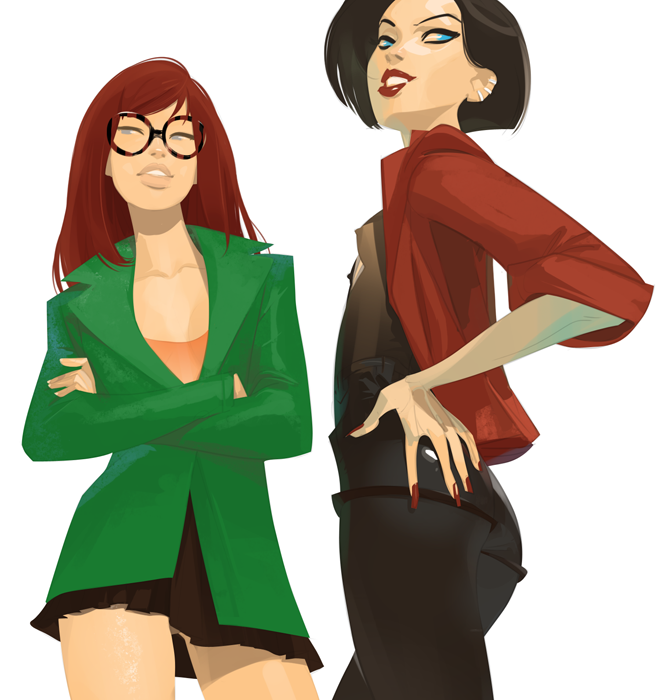 I've linked to Otto Schmidt's art before, but this tribute to Daria and Jane is the best thing he's done for those who love the 90's! Galway Pub Scrawl #76 - Catastrophe! Add more Cats! 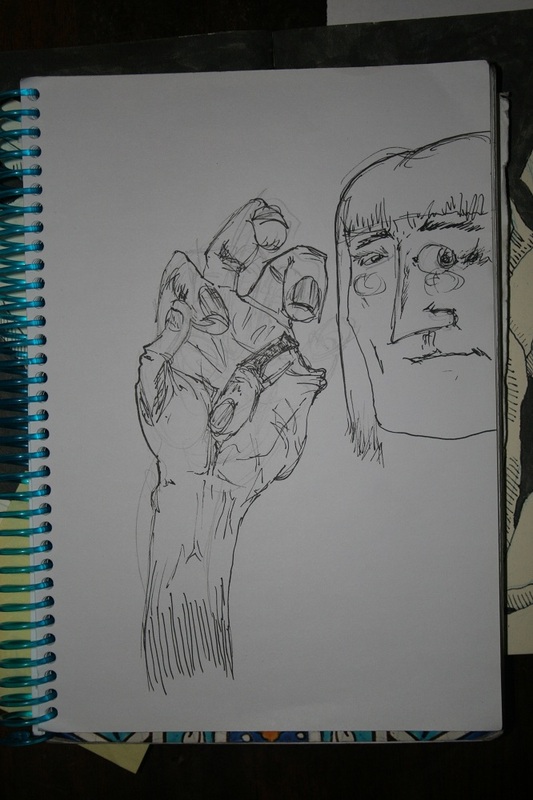 Alan was drawing ever more elaborately. He says it was cos I gave him an eraser. Declan was working on class project work, so I only took a small snap. 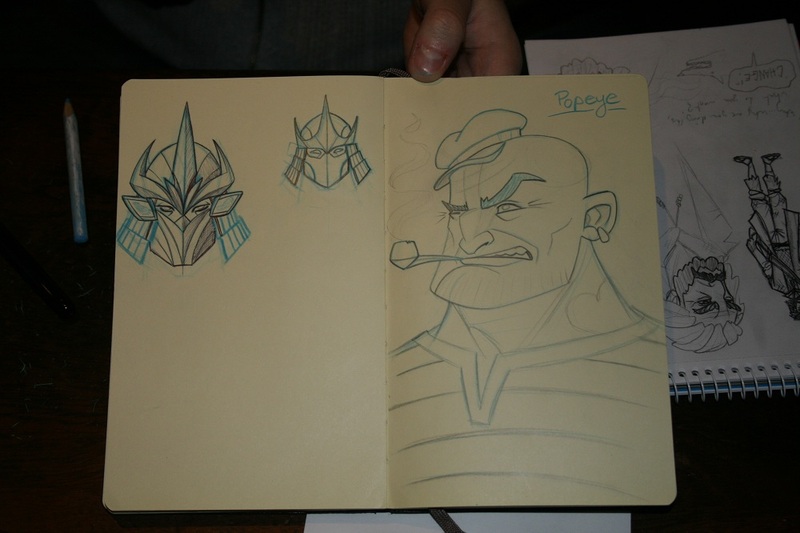 Ger drew these awesome faces in between Samurai. And Patrick gave us Popeye. No Pub Scrawl in two weeks - cos that's Christmas Eve. 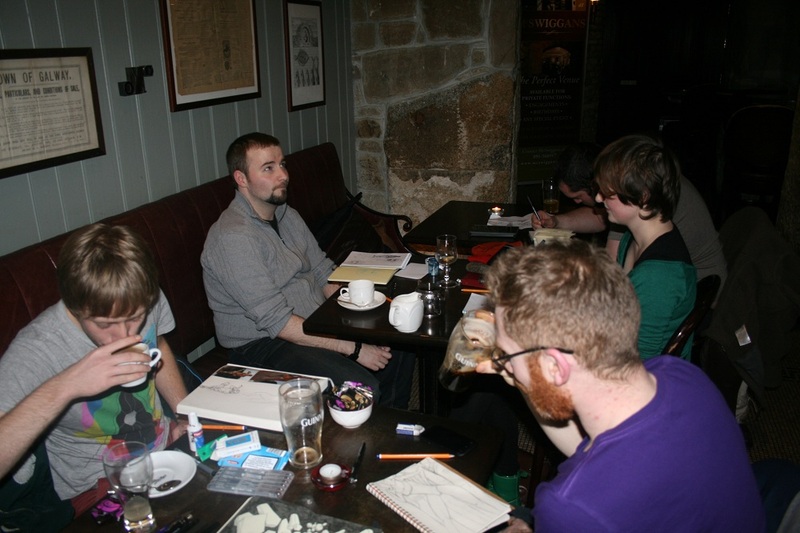 Join us in a months time (the 7th of January) for the next Pub Scrawl on the 7th of January 2013 - Pub Scrawl is filmed in front of a live studio audience! We had tons of fun in 091 labs last week for our Galway Lab Scrawl! Make sure to check back and see what we got up to! 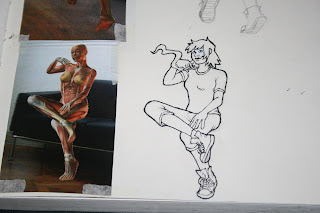 Jay Penn has started a new blog interviewing Artists and reviewing books - go check it out! J. 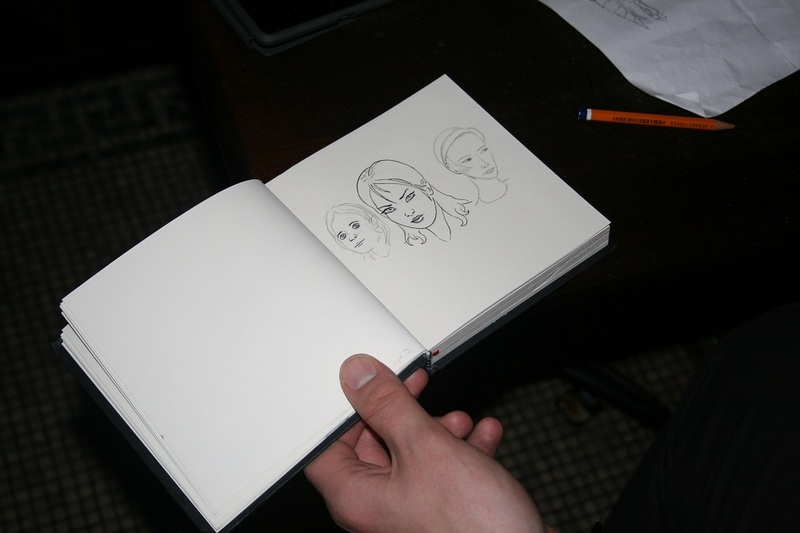 Bone shows us how to make a sketch diary/tumblr funny and insightful. Riki Blanco made this amazing "book-like" experience entirely in Flash for you to download for free. "Depopulated Hopper" shows how unimportant the figures are in Hopper's bleak Americana paintings. I sprang this one on the guys last weekend, go check out THECAB (The Concept Art Blog) and prepare to lose your week looking at it. Chucky pointed out this cool list of the best Art Books of 2012 - I will be buying a few from this list, it is good. Dirk Bach's "story-filled" coloured pencil drawings are a joy to look at. Michael Cho did these awesome drawings for Occidental College's recruitment booklet. PaddyD. pointed us toward this website of a super talented Wildlife Artist, David Daly. Tomoko Shintani draws really cute drawings and continues them onto her Starbucks cups. And that's it from me for another fortnight... I feel like I'm forgetting something (which is what the edit button is for, amiright?)... make sure to check back next Monday for our adventures at another Galway Pub Scraaaaaaaaaaaaaaaaaaaaawl!